The PCE-UT 512 insulation meter is the ideal tool to be used on site and workshops under the most difficult measuring conditions. 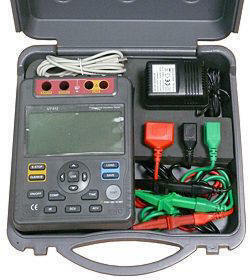 The PCE-UT 512 insulation meter is sent in a durable carrying case. The large backlight LCD display of this insulation meter shows the most important magnitudes while the bar graph allows to see the insulation resistance development. The Guard-entry can be used to prevent measurement values counterfeit due to the residual current. The PCE-UT 512 has different measurement modes available to perform fast and easy standard measurements, and for continuous measurement you can define the measurement duration beforehand. In the comparative mode, after introducing the limit value, you can detect if the measuring object is above the programmed limit value (Pass/Fail test). The PCE-UT 512 insulation meter is able to perform polarization test (PI test) by autonomous action. In order to do that, the insulation resistance is twice measured in an adjustable interval bringing both parameters into touch. With the PCE-UT 512 insulation meter it is possible to measure alternating and direct voltage up to 600 V. With the USB port data can be transferred and registered by means of the software. The following link has an overview of all the available insulation meters which will suit your needs. The PCE-UT 512 insulation meter in its carrying case. 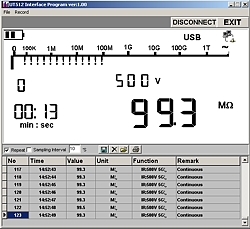 Software of the PCE-UT 512 insulation meter. 1 x PCE-UT 512 insulation meter, 1 x software with USB data cable, 1 x set of testing cables , 1 x carrying case, 1 x mains component and user manual. For companies that wish to incorporate the calibrator into their set of internal test equipment or for annual recalibrations. The ISO certification includes a laboratory calibration with a test certificate with all the measurement values. With this resistance calibrator for insulation meters you can test the proper working and accuracy of the insulation meter. Resistance can be selected between 100 kΩ and 100 MΩ. 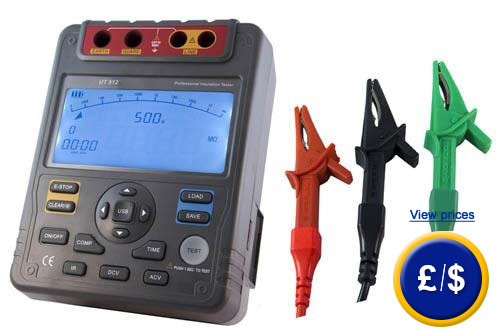 This resistance calibrator offers two lower resistances to test milliohms.